It’s no secret — the Washington Redskins and their first round opponent in the 2012 playoffs, the Seattle Seahawks, are very similar on offense. Both teams are led by gifted rookie passers (Robert Griffin III and Russell Wilson) who managed to exceed expectations in the first year. Both teams love to put the ball in the hands of an elite running backs (Alfred Morris and Marshawn Lynch) who plays with a physical and punishing style. Both teams have little trouble moving up and down the field while putting a ton of points on the board. But the one area the Redskins appear to have an advantage over the Seahawks is at wide out — where, thanks to Pierre Garcon, they have a true number-one receiver. With apologies to Golden Tate and Sidney Rice, neither player brings as much to the table as Garcon, who head coach Mike Shanahan believes would have finished the season with between 1,300-1,400 yards had he remained healthy all year. Of course, Seattle might have the top cornerback tandem in all of football this season in Richard Sherman and Brandon Browner, so Garcon and the rest of the Redskins receivers will still have their work cut out for them Sunday. Does Garcon relish the chance to go toe-to-toe with bigger, more physical cornerbacks, like Seattle boasts in their secondary? “I always look forward to playing football,” he said. “Whenever I get the chance to play football, it’s an opportunity for me to prove what I can do. Hopefully it goes well on Sunday, but I always look forward to playing the game. They can take me however they want, but I’m going to play hard, be physical and play my game. Regardless of what they do, I’m going to be me. I can’t change because of who I’m playing against. “It doesn’t matter who we play against — physical corners or non-physical — I’m going to be me and continue to play hard and do what I have to do to help my team,” he added. Every defense has holes and ways they can be exploited. What do you see when you break down film of Seattle defense? In four postseason games, Garcon has 26 receptions for 367 yards with three touchdowns. That works out to roughly six catches for 90 yards and a touchdown, which would obviously be a good day for the 26-year-old if those were his stats against the Seahawks. Garcon’s first season in Washington was hampered by a lingering foot injury. I was curious if this seven-game winning streak helping make up for the fact that he missed six games earlier in the season. 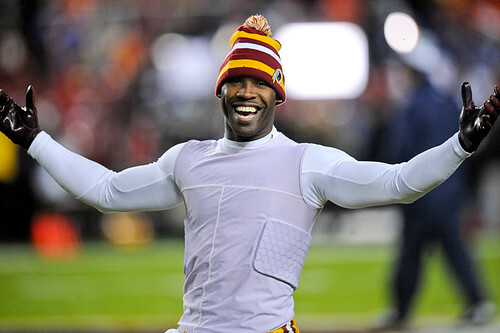 Injuries aside, how pleased was Garcon with his first season in the burgundy and gold?